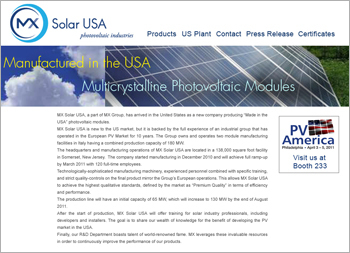 Mx Solar USA a division of Italy based solar panel manufacturers recently open US plant. Webb worked with MX Solar management team to create initial online branding at ww.mxsolarusa.com . Webb is expanding the project by developing a full featured site that will highlight manufacturing, product lines, sales info and corporate news.